If you want a piece of mail to be delivered on a Saturday, try putting it in a box: The money-losing U.S. 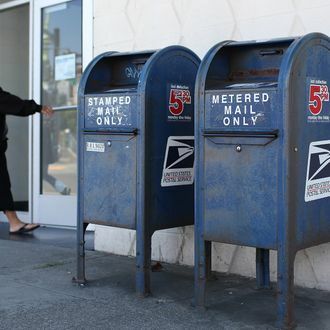 Postal Service is set to stop delivering mail on Saturdays, except for packages, priority, and express mail, in a plan that will save about $2 billion a year. While post offices will remain open six days a week and P.O. boxes will still get deliveries on Saturdays, it’s a baby step toward the five-day delivery plan the agency has long fought for and that Postmaster General Patrick Donahoe says more than 70 percent of Americans support. The problem has been Congress, which isn’t funding the Postal Service with tax dollars — and, in fact, might be sinking it — but still maintains control. As the Associated Press notes, “It was not immediately clear how the service could eliminate Saturday mail without congressional approval.” But Representative Tom Coburn of Oklahoma did say, according to CBS, “It’s a proper business decision and [in the] long run, good for the Postal Service and good for Americans.” Asked if he thought the agency was strong-arming Congress into acting, he added, “No, I don’t think so at all. Look, they’re in survival mode. … They’re losing $25 million dollars a day. A day. They have to do something.” Coburn and Representative Darrell Issa are writing a letter to their colleagues asking them to just roll with it. The plan would go into effect on August 1. At Reuters last year, Felix Salmon called the Postal Service’s financial problems “a prime example of U.S. political dysfunction” and blamed lawmakers. “Congress requires the Post Office to make inordinately huge pension-plan payments, for reasons which nobody can really understand,” he wrote. “The Post Office is broken, in large part thanks to unhelpful meddling by Congress. And it won’t get fixed unless and until Congress gets out of the way and stops forcing it into the corporate equivalent of ketosis, essentially consuming its own flesh in order to survive.” In the last six years, the Postal Service has lost $41 billion dollars, cut hours at post offices, and laid off 35 percent of workers. Meanwhile, we throw most of it out and go back to our e-mail.